We already had an “It's Official” article for the PlayStation 4 denying any and all DRM, but Sony's U.S. president Jack Tretton took to the stage at the E3 press conference that Sony held tonight to officially denounce rumors and officially announce that the PlayStation 4 will not have any form of used game, rental, internet or disc-based DRM. It is the complete opposite of the Xbox One and Microsoft's policies. We believe in the model that people embrace with the PlayStation 3. When a gamer buys a PlayStation 4 disc they have the rights to use that copy of the game. They can trade in the game at retail, sell it to another person, lend it to a friend or keep it forever. In addition, PlayStation 4 disc-based games don't need to be connect online to play or for any type of authentication. If you enjoy playing single-player games offline, the PS4 won't require you to check-in online periodically. And it won't stop working if you haven't authenticated within 24 hours. 1.) The PlayStation 4 can play games offline without having to be online. This was clarified the day of the PS4's reveal back on February 20th. 2.) Sony will not have any mandatory DRM for used games. You can buy, play, trade used games on the PlayStation 4 just as usual. No additional registration fees, pay-walls or internet registration required. 3.) If you so choose, you can play games from disc, download them from the digital store or remote load them. Sony doesn't mandate any method over the other for multi-format titles. 4.) Just for extra clarification the PlayStation 4 does not and will not require a constant always-on internet connection. For those of you who can't remember why you should be so happy that you can game on the PS4 the way you've always gamed for the past 40 years, just read up on the Xbox One's DRM policies right here and weep for the sad state of our corporate-fueled society. 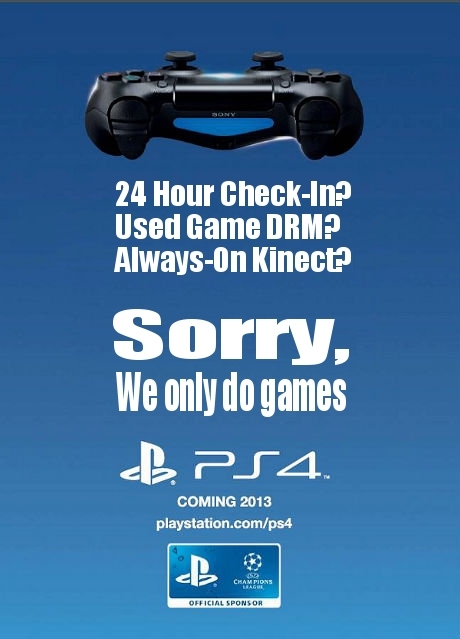 With that...I say, thank you NeoGaf and Pete Dodd, for the #PS4NoDRM campaign. If you guys are watching or whatever, thank you a ton, thank you from the bottom of our interactive-entertainment laden hearts and we appreciate what you guys managed to get across in such a sweeping and media spotlighted fashion. We owe you one, but please don't ever call in that favor. For everyone else, you can at least take some solace in Neogaf Man blasting the living daylights out of DRM in this video or check out the PlayStation Used Game Instructional video below. Enjoy.